Koncept Tech handles sales of wear and spare parts for all machines and leading brands in global meat-, poultry-, cheese and butter processing industries, as well as on the global pet food, rendering and fur industry. Koncept Tech also purchase and sell refurbished and used equipment. All parts are manufactured according to original specifications. Please feel free to submit a request to receive the High Value Parts catalogue. 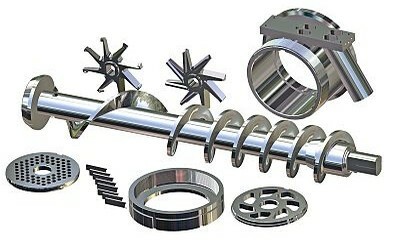 Your costs to run your machines and processing lines will be reduced significantly by using our original wear and spare parts, offered with short delivery times and competitive prices. All items, parts, and accessories listed on the website of Koncept Tech Aps, are manufactured by Koncept Tech Aps, or manufactured to Koncept Tech Aps, specifications. The names of the original equipment manufacturers referred to on the Koncept Tech site, such as but not limited to: Carnitech®, Handtmann®, K&G®, CFS®, GEA®, Karl Schnell®, KS®, Laska®, Palmia®, Petsmo®, Seydelmann®, Simo®, Haarslev®, Weiler®, Mincemaster®, ANCO®, Cozzini®, Wolfking®, Comvair®, Autio®, Beehive®, Yieldmaster®, Meatmaker®, Poss®, Townsend®, etc., are all registered trademarks of their respective companies. All original equipment manufacturer's names are listed as Carnitech® type, Handtmann® type, K&G® type, CFS® type, Karl Schnell® type, KS® type, Laska® type, Palmia® type, Petsmo® type, Seydelmann® type, Simo® type, Haarslev® type, Weiler® type, Mincemaster® type, ANCO® type, Cozzini® type, Wolfking® type, Comvair® type, Autio® type, Beehive® type, Yieldmaster® type, Meatmaker® type®, Poss® type, Townsend® type to indicate that these items are manufactured by Koncept Tech Aps, and not the original equipmentmanufacturers. Unless specifically stated otherwise, Koncept Tech Aps, has no association or affiliation with any entities/ companies listed.